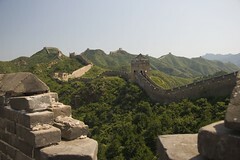 There are three things to say about the Great Wall of China: WOW, WOW and WOW. Its sooo immense and covers some hairy terrain. The wall even goes along the top of cliffs that seem to make it pretty useless as the cliffs do a better job anyway. I suppose they wouldn’t just stop the wall for a couple of miles just to save some work because then it wouldn’t be so MASSIVE. Bianca was feeling ill for a fair bit of the walk from Simatai to Jinshanling which is around 10km of serious up and downs.